The Anthea's Garden project has a large history and many people have been important to the success of the work or influenced its outcome in some way. I have created this page as a way of documenting aspects of the project that may not have been included in the final Anthea's Garden book/music but were important to the process and creation of the work. Please feel free to email me (via the contacts page) any comments or content for inclusion on this webpage. 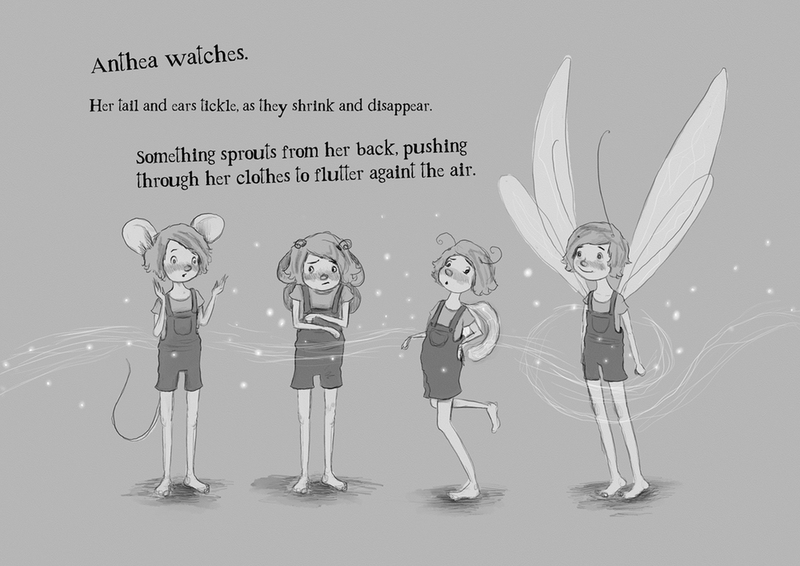 Help support the Anthea's Garden children's book project!! To all the lovely people who supported our campaign on Pozible.com, thank you so much for your support. We reached 150% of our target and we couldn't have done this without you! We'd really like to take this project further by making an e-book and taking the live Anthea's Garden show into schools and into regional areas of Australia. If you would like to support this initiative you can order book/s through our shop page. Or alternatively you can make a donation here. An article on the Anthea's Garden book project has been featured in the Australian Music Centre's online magazine Resonate. Click here if you're interested in having a read. 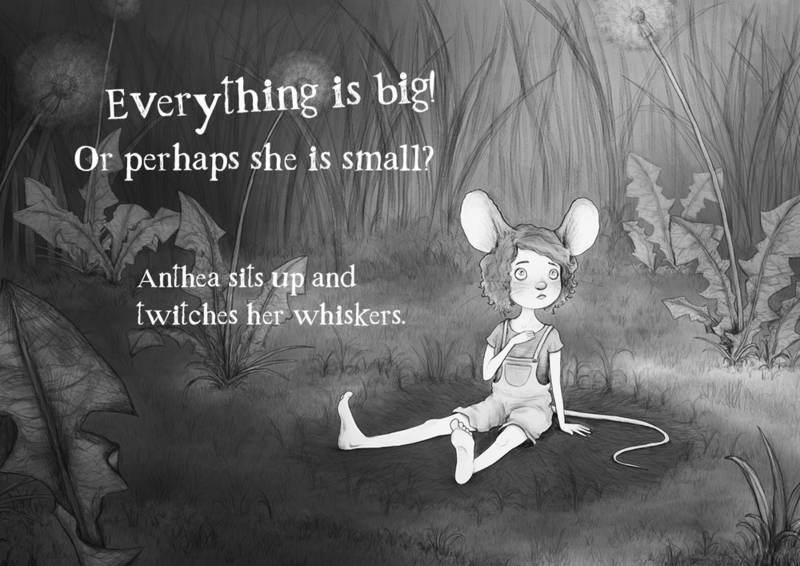 Anthea’s Garden is about a little girl who has a series of dreamlike, magical adventures. 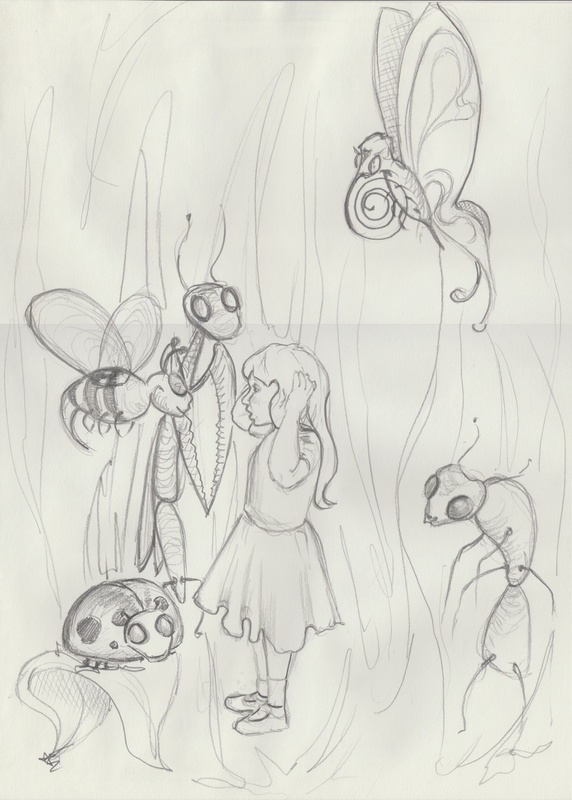 She has shrunk to the size of a mouse and explores her garden where she finds a runaway pot plant, her giant cat, fairies dancing, and a parade of insects. Set in a suburban backyard in Melbourne, the story encapsulates the magic of childhood through the power of the imagination and children’s instinctive fascination with nature. Anthea’s Garden is a tribute to Anthea McKie (1980 – 2003): a close friend and fellow artist. 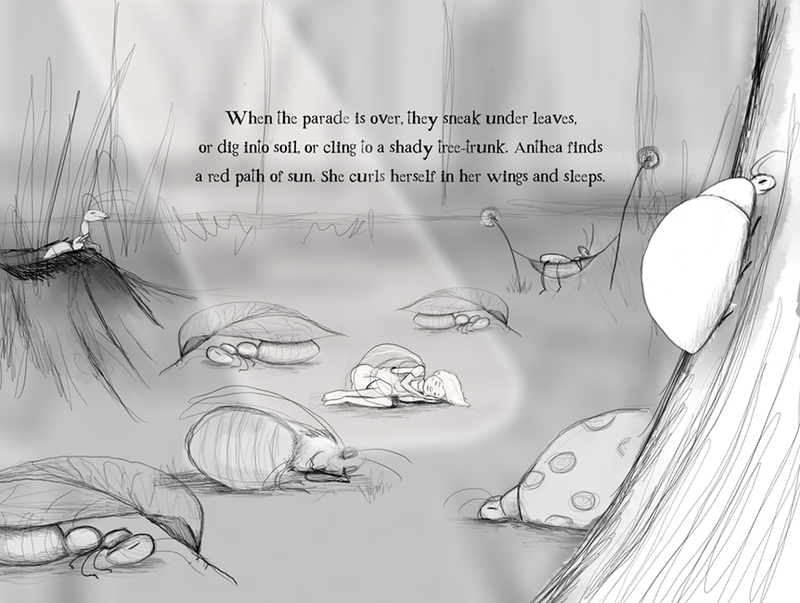 Anthea had wanted to illustrate children’s books and I had intended to ask her to illustrate the pictures for this work, when I learned of her unexpected passing. Instead, the themes explored in the musical content became a reflection of my memory of Anthea herself. Her interests, and things that she loved inspired the creation of Anthea’s Garden. Self portrait by Anthea McKie. The Anthea’s Garden project first began over ten years ago (2003) when I was commissioned by Carmen Chan to write a solo percussion piece for her Masters recital. The theme for her recital was “children’s games” so the piece needed to appeal to children. Co-incidentally Carmen was my neighbour at the time and she could hear me composing the piece through the open windows. I remember with some amusement her yelling through the windows "Is it going to be that fast" and me yelling back "you said you wanted difficult". As I was working on this music, I could see that the structure was taking shape as a series of movements that could be tied together into a kind of children's story. The story could primarily be told with music but I liked the idea of using illustrations to help convey what was happening in the music. My artist friend Anthea passed away as I was writing the music and from the time I learned of Anthea’s death, the piece evolved into a personal tribute. 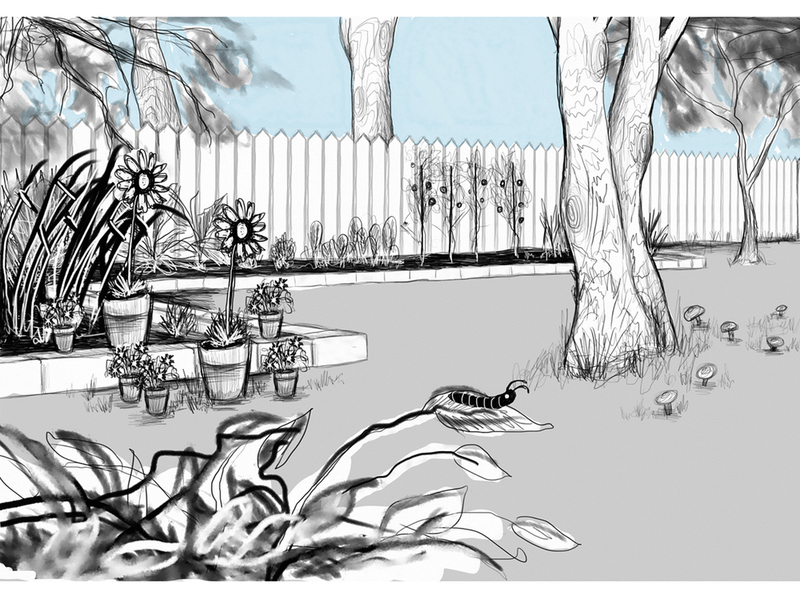 My memory of Anthea and the things that she loved: cats, fairies, insects, and a sunflower pot plant, gradually etched out the foundations around which the music and story of Anthea’s Garden took shape. I found an artist, Kelly Hobbs to illustrate a few black and white pencil drawings to go with the music and the work was performed at Carmen’s recital as planned on the 12th of June 2003. The above illustrations were drawn by Kelly Hobbs for the 2003 edition of Anthea's Garden for solo percussion. 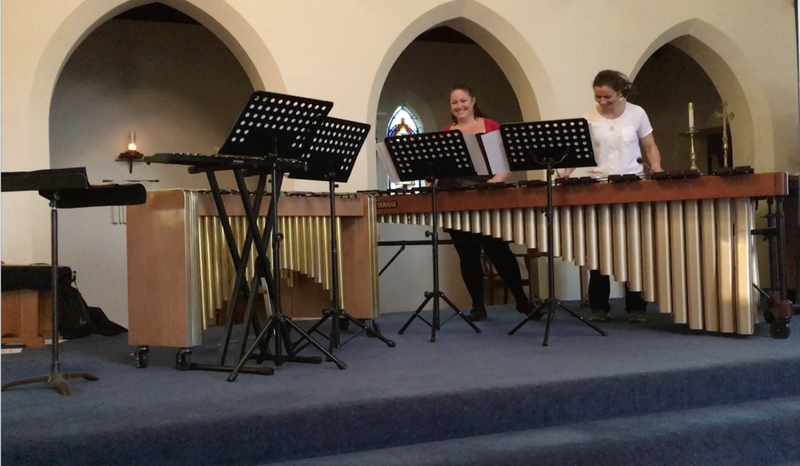 Following this performance, perhaps due to its level of difficulty, I was unable to interest other percussionists in performing the piece and so I shelved the work indefinitely to focus on other projects. 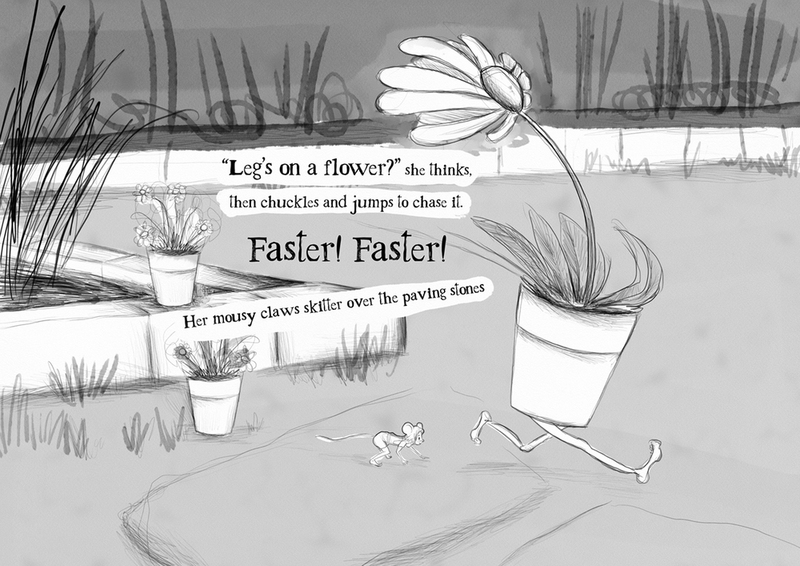 Over ten years later in 2014, Carmen suggested I arrange Anthea’s Garden for two players instead of one, to reduce its level of difficulty and to make it more accessible to performers. As I’d been dealing with having a baby, serious family illness and moving to and living in Hong Kong, I had not written anything substantial for around two years. I had to a large degree replaced my composition work with teaching as a means of securing an income. Teaching music was something I loved immensely and I wasn’t sure whether writing music was something I still wanted to do, but Carmen’s idea intrigued me, and I was curious to find out what would happen. I took Anthea’s Garden back off the shelf and began to arrange the music for percussion duo. The inclusion of another performer opened up a whole new range of compositional possibilities that were previously impractical and I couldn’t resist the temptation of significantly rewriting the music. But it didn’t end there. 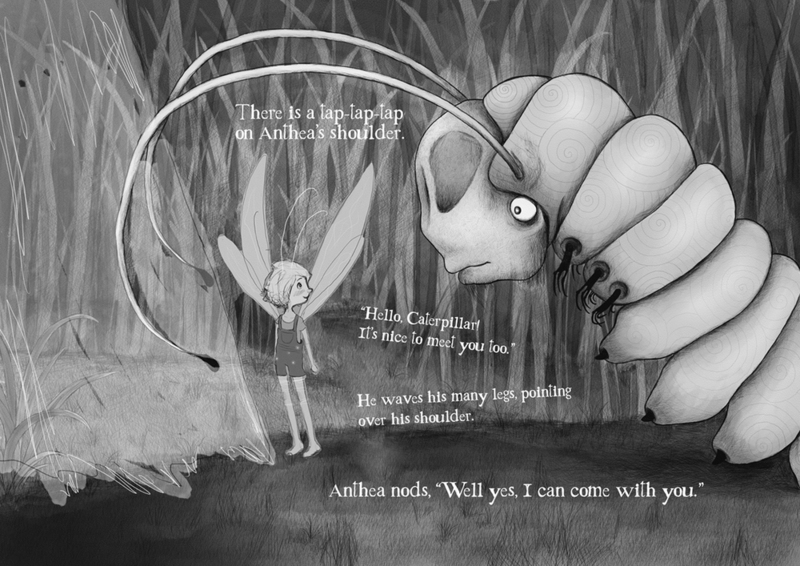 This small suggestion to arrange Anthea’s Garden marked the beginning of what evolved into a major two-year project to transform this new edition of music into a children’s book, with words and illustrations to accompany the music, and if all went well, an iBook. 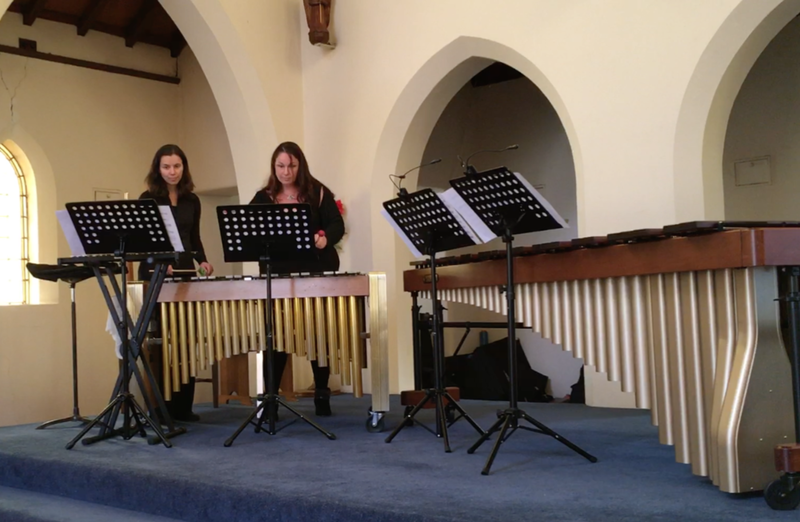 The percussion duo arrangement of the music for Anthea's Garden was completed in May 2014. The recording: performed by Collision Theory was recorded by Frank Pearce in July 2014. Author of "The Squid, the Vibrio & the Moon", Ailsa Wild completed the words in December 2014 and recorded the audio book with Frank in February 2015. Left Katherine, middle Ailsa, right Simon. Winner of the Dorian Le Gallienne Composition Award 2003, Katherine Rawlings is a Melbourne-based composer of music: thematic and emotive in style, and inspired by visual, emotional, literary and political ideas. An assessor from the Australian Music Centre describes her music as ‘a truly individual voice’ whose ‘concepts are so timeless and relevant’. Her music has been performed/commissioned in Australia and abroad by numerous performers including the Melbourne Symphony Orchestra, Orchestra Victoria and The Zelman Memorial Symphony Orchestra, live on 3MBS and for several short independent films including: Red Lips and Yellow by German director Iris Heller that was nominated in 2004 for a Golden Eye Award for best film score and was featured in the 2014 IASD (international association for the study of dreams) Dream Art Exhibition in Berkeley, CA. Her music will be performed by Canadian based string quartet The Northern Lights Quartet in France in July 2015. Katherine has studied composition with some of the most accomplished composers in the country including Brenten Broadstock, Richard Mills, Stuart Greenbaum, Mary Finsterer and Katy Abbott. She holds a Bachelor of Music from the Melbourne Conservatorium of Music, a Master of Music from the Sydney Conservatorium of Music and she has had many works sold and distributed nationally and internationally through the Australian Music Centre. She was short listed for the APRA Professional Development Award 2009, the Degrassi Resident Artist Program 2008, nominated for best soundtrack for the RMIT Creative Media Screen Awards 2003 and joint winner of the Uni. Melb. Percussion Composition Competition 1999. Ailsa Wild is a writer-performer who creates fiction, non-fiction and physical theatre. Her memoir piece ‘Monsieur Gaulier takes a Class’ was published in Meanjin (1,2014). Ailsa is the writer on Arts Victoria funded theatre project, String Thing, a solo performance by Asking for Trouble, developed in 2014. Ailsa co-wrote and devised Asking for Trouble Physical Theatre’s two shows Bubblewrap and Boxes (2008) and Kapow! (2010). Both won Best Family Show in the Melbourne Fringe, received Arts Victoria, Touring Victoria funding and played in New Zealand, the UK and arts centres across Australia. Kapow! headlined the Sydney Children’s Theatre Festival 2014. 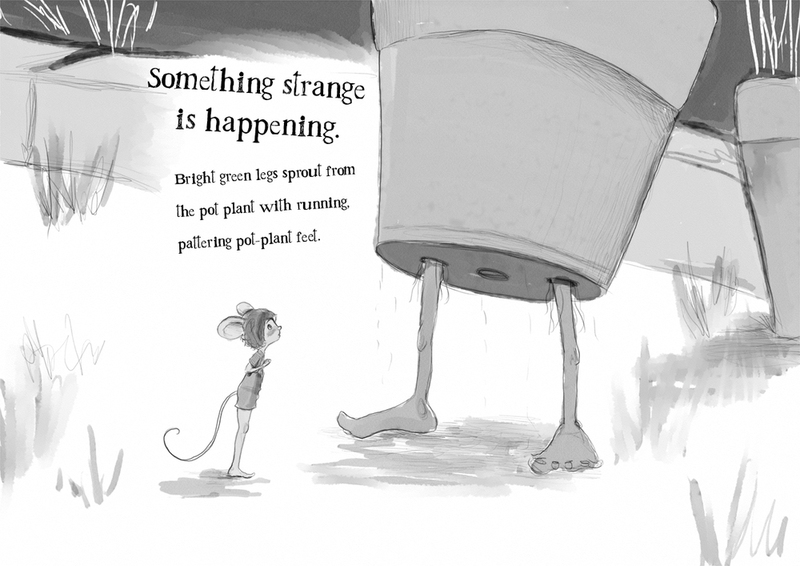 Ailsa wrote The Squid, the Vibrio & the Moon (2013) and Zobi and the Zoox (2015) illustrated science adventure stories created and published by arts-science collective Scale Free Network. Simon Howe is an illustrator and animator who runs a small, Melbourne-based business called No Such Place. Originally from England, he grew up in North Queensland and studied Fine Arts at QUT in Brisbane. Making the move to Melbourne in 2008, he studied Animation at RMIT before creating No Such Place and assisting the management and development of Chantilly Studio Inc, a not-for-profit creative workspace in the Nicholas Building. 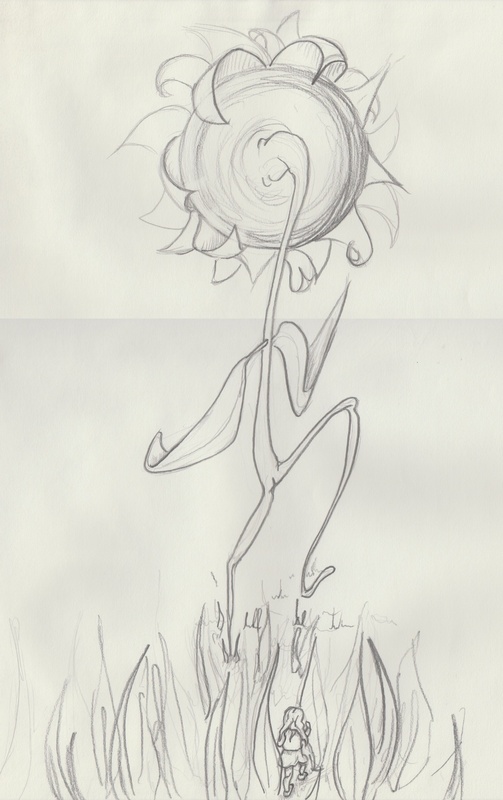 His character designs strive for an innocence and whimsy, often incorporating floral elements to suggest ideas of growth and passing beauty. In between various commercial pursuits, Simon is currently developing the writing and visual style for his own 2D animated short film. Amy Valent Curlis has built her career on diversity. Current projects include Collision Theory (percussion duo), Nick Larkins and the Bones (garage rock band) Jack Howard and the Ambassadors of Love (Burt Bacharach band) and Arcko Symphonic Ensemble (Focusing on contemporary Australian compositions). Amy is passionate about presenting Australian music and has been part of dozens of premieres. She has appeared on numerous film and TV soundtracks, including Summer Heights High, has performed as soloist with 5 different orchestras (including 2 concerti written for her) and has toured as support act to Led Zeppelin’s Jimmy Page and Robert Plant. She has run music classes for adults and children with severe physical and intellectual disabilities. She toured Northern Territory performing and running workshops on Aboriginal Communities and is currently teaching drum kit and percussion to students from grade 2 – Year 12. Arwen Johnston studied at the Victorian College of Arts and has completed a post-graduate degree in Amsterdam, Holland. As a diverse freelance percussionist, Arwen works with a variety of regular ensembles as well as individual projects. She is principal Timpanist with Melbourne Opera Company and Concentus Australis baroque ensemble. She performs regularly with the Australian Philharmonic, Victorian Opera, Gloriana Choir orchestra, Australian Music Events, the Australian Symphony Orchestra, Melbourne Bach Choir orchestra, Scots Church orchestra, Australian Chamber Choir orchestra and Alpha Sinfonia. Arwen has performed in Asia as percussionist with The Macau Orchestra. She is involved in regular composition workshops as part of Melbourne Symphony's Outreach/artplay programs and is a dedicated tutor and educator at two of Melbourne's top private schools. Arwen has toured Australia with rock legends Roger Daltrey and Alice Cooper, has performed with comedian Jerry Lewis and with Delta Goodrem/ Andrea Bocelli Australia/New Zealand tour in 2014. Arwen has toured Europe with Collision Theory percussion, Geminiani Orchestra, Sweelinck Orchestra and as a chamber ensemble for Bartok's Concerto for 2 Pianos & Percussion. During her time in Europe, Arwen co- founded the percussion group Spǽnge, performed regularly with Transcenturia Ensemble and Opera Minora, the professional musical Grace and collaborated regularly with designers and artists. Arwen has performed various concerti, has had numerous works written for her and has recorded music for film soundtracks, orchestras, composers and rock bands both in Australia and Europe, including music for the Beijing Olympics Opening Ceremony in 2008.